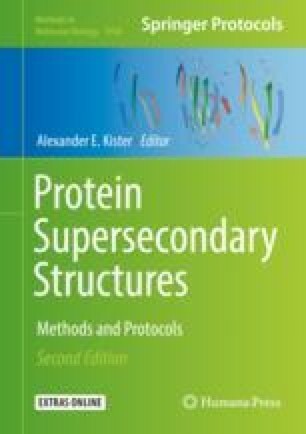 The goal is to define sequence characteristics of beta-sandwich proteins that are unique for the beta-sandwich supersecondary structure (SSS). Finding of the conserved residues that are critical for protein structure can often be accomplished with homology methods, but these methods are not always adequate as residues with similar structural role do not always occupy the same position as determined by sequence alignment. In this paper, we show how to identify residues that play the same structural role in the different proteins of the same SSS, even when these residue positions cannot be aligned with sequence alignment methods. The SSS characteristics are (a) a set of positions in each strand that are involved in the formation of a hydrophobic core, residue content, and correlations of residues at these key positions, (b) maximum allowable number of “low-frequency residues” for each strand, (c) minimum allowed number of “high-frequency” residues for each loop, and (d) minimum and maximum lengths of each loop. These sequence characteristics are referred to as “sequence pattern” for their respective SSS. The high specificity and sensitivity for a particular SSS are confirmed by applying this pattern to all protein structures in the SCOP data bank. We present here the pattern for one of the most common SSS of beta-sandwich proteins.